Another rocking installment of our Friday New Product Post. We told you we were moving our posts to Friday, but you didn't believe us! But, really, from now on the New Product Post will be on Fridays. Last week we introduced the world to the Dreadmill and this week, we introduce the Sound Squid. The Sound Squid really can create quite a bit of noise, but is also very addicting to play with. The variety of sounds come out of the Musical Instrument Shield. 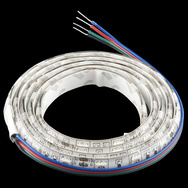 Our addressable RGB LED strips are pretty cool. Unfortunately, our last shipment hadn't fully cured before we packed them up, so the coating cracked in some places.Thankfully, this didn't hinder their functionality, just their waterproof rating and aesthetics. We separated all these out, hand-tested them, and are selling them as ding and dents. If you don't need them to be waterproof and are looking for a good deal, check them out. 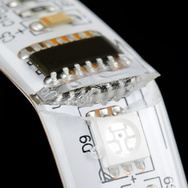 Also, in addition to our addressable LED strips, we have some ding and dents of our regular RGB LED strips as well. When we cut the 5M lengths into 1M sections, we have some leftovers that aren't quite 1M. These sections are perfectly usable, but just aren't the full 1M length of our others. They measure roughly 3 feet and are a bit cheaper. Get them while they last! 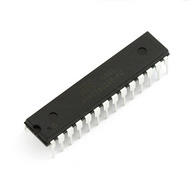 The VS1053 is a very versatile chip. It can do a lot of things, but one of the coolest features is its MIDI capabilities. With an expansive bank of instruments, you can play almost every instrument you could ever want to use. 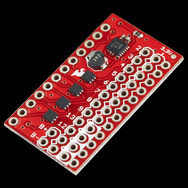 Our Musical Instrument Shield gives you a simple way to use the MIDI capabilities of the VS1053 with your Arduino. If you're just finding out about E-Textiles, you might not want to dive in head-first with code, programming, and sensors. Maybe you just want to sew some lights into clothing. 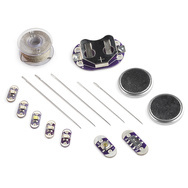 The LilyPad E-Sewing Kit includes all the basic components you need to do just that. It includes some thread, needles, switches, batteries and LEDs so you can add some light to your next E-Textiles project. We now have our conductive thread wound up for you on a plastic bobbin. 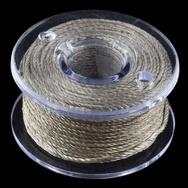 The bobbin includes 30 feet of thread and will help you avoid tangling up your thread. 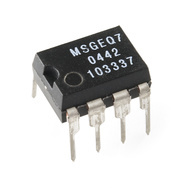 If you want to switch larger amount of current but don't want to use bulky relays, you might want to use MOSFETs. We already have our Power Driver Shield Kit and our MOSFET Power Control Kit, but what about something smaller? 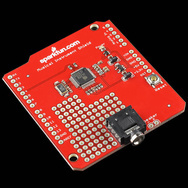 Our Mini FET Shield is a shield for our Arduino Pro Minis and can switch up to 2A across 8 different pins. The ADH8066 is a very useful cellular module. Like most modules, it relies on a surface-mount connector which can be a bit tricky unless you have the right tools. Thankfully, our new ADH8066 Breakout Board allows you to easily use the module without the hassle of the fine-pitch connector. For everyone who wants to breadboard their own designs, we have the ATMega328 IC preloaded with the Optiboot bootloader. This is the bootloader that the Arduino Uno uses. It comes ready to plop into a breadboard and will accept code as an Uno in the Arduino IDE. We've had a lot of fun with the MSGEQ7. It's used in the Colorganic Spectralizer and our Spectrum Shield. We've been selling the bare IC for some time, but the new version is now RoHS-compliant, which is much nicer. Well, that's it for this week. We'll be back again on Friday for more new products and quite possibly another mini-project. Thanks for reading and watching! There should be a video about the items in the background during the product post video. Especially the plane and posters. Hum, I'm not sure it could be a whole video. I can explain the posters though. The top one is a Nejisaurus poster that shipped with the Screw Removal Pliers. The one below that is last year's AVC poster and the one on the far right is one of my actual wedding invitations, done by my wife and myself. More evidence that you should ship things with the labels on the bottoms of the boxes! 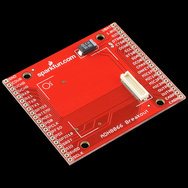 Someone please tell me why im reading about the Android "IoIo" product from Sparkfun from the engadget website!?!?!! This product is absolutely awesome. i love this company. If we can't come here for bleeding edge SparkFun news, how are we supposed to feel all elite when the plebeians see the news a day later? It's because the the white top part of the desk isn't completely stable. If you review some of the older videos you will see the whole thing move. I think it is probably a large piece of plywood painted white and laid over an office desk. Or something of that nature. PS. Didn't notice it until I read your comment. Two points for being incredibly observant! I can assure you that the desk is quite sturdy. What you can't see is that Robert is actually running on the dreadmill the entire time he appears to be sitting at that desk. The movement of the pens is likely related. Looks like he's mastered the noise control!